Karma belongs to all beings. It is inherited and related by them. It has become the root cause of their happiness, sorrow and suffering. It has become their refuge. Therefore, the consequences of a good or a bad deed a person does, would solely be his. 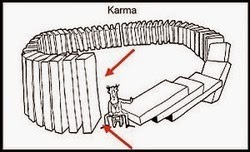 Finally, the Destructive Karma brought his life to a miserable end when he was dragged to hell alive. The good Weighty Karmas give intellectual powers such as Jhana (a state of deep mental unification) or, great physical merits. Consists of four heavens (realms), whose inhabitants are possessed entirely of mind. They have no physical body and unable to hear Dhammateachings. Those who have died while meditating in the formless jhanas are born here.